If the week between Christmas and New Year is a good time to announce a presidential campaign (by the way, my favorite post of Robert Scoble’s from his time with John Edwards is his Things I Learned and I noted this Time article too), then it’s a good enough time to announce our new family videoblog: Guinea Pig TV. Last year at Northern Voice I mentioned I was experimenting with videoblogging and I even included a couple quick clips in the presentation I gave. There were a few bumps in the road this year, but as soon as I could, I started learning with iMovie. After years of refusing to categorize my blog, I figured I would experiment with ultra-niche blogging. A videoblog about a talking guinea pig: how much more niche and specific can you get? Guinea Pig TV also allows the girls and I to grow and learn together. I had made a couple simple movies but Guinea Pig TV is challenging my skills with video, editing and music. The girls learn how to develop ideas, write a script and even in one episode practice the German they have learned this year. Kids can gain experience speaking in front of a camera spontaneously. They see the benefits of planning and flexibility along with the joy of sharing, all aspects of creativity. For homeschooling, Washington state includes computers in “occupational” skills. I’m sure the girls are learning skills they could use in the work force (after all people do get paid to make videos), but I think this has other educational values also. Finally Guinea Pig TV involves one of our family’s new passions of 2006: Chatterboy. I don’t think I’ve done an official post about our new pet yet. In August we adopted him from another family who didn’t have time for him. According to 4-H standards he is an “American broken senior boar”, but to the girls he is their favorite object of affection. Guinea pigs are excellent first pets, easy for a young child. They need only food and water once a day and he is happy to eat vegetable scraps for treats. Changing the cage is probably the biggest challenge we have had so far; finding a bedding that is absorbent, odor-free and not tempting to Chatterboy’s taste buds is harder than it seems. It is also the only task where Abigail needs my help. After taking care of frogs, fish and butterflies, we are enjoying having a pet who is communicative, cuddly and fun to feed. And yes there are plenty of videos of guinea pigs on YouTube as I discovered, nearly 9000 as I am writing this. Quite a community. There are videos of guinea pigs (or cavies, as they are called) doing tricks, climbing stairs (maybe it will motivate ours!) and looking for lettuce. Two other funny links: the amazing Guinea Pig Song video (I wish I knew who made this) and The Bad Guinea Pig List So there are plenty of people who love cavies and have computers, but as far as we can tell, our Guinea Pig TV blog is the first guinea pig videoblog. I must note that I am grateful to Derek K. Miller for allowing us to use his music, in particular Meltdown Man which is the theme for Guinea Pig TV. We’ve been creating shows since Halloween, when someone gave us a small plastic trick-or-treat basket, instantly inspiring the first episode. It took me a while to edit the video and put it up on the blog. My favorite episode is still that first one: Trick or Eat. In Episode #2, the girls and guinea pig practice their German, inspired by myGermanClass.com (congrats to the creator on achieving top 100 status and also daddyhood!) as well as occasional bumbling conversations with the generous and gentle Roland and Boris(you know, that German Canadian). Episodes #3 and #4 document our unusual winter weather in the Northwest, snow and power outage. What did Chatterboy do? 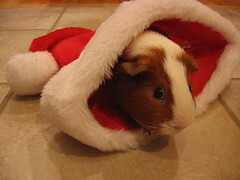 Episode #5 features a cavy Christmas carol, O Christmas Pig, as written on Caviesgalore along with holiday wishes from GPTV. Abigail wrote and filmed Episode #6 Prince of Piggyland by herself, and I put it together under her direction. She was inspired by The Chronicles of Narnia – and the Christmas gift of small statuesque guinea pigs – to give her pet new titles and to chronicle them in video and pictures. Even if you are not a fan of guinea pig videos, I hope you’ll take a peek. And, to slightly change this Tim Bray quote, I can hope that what Tim said about Northern Voice might also be said about Guinea Pig TV: it probably wonÃ¢â‚¬â„¢t blow your mind but it might fill cheer it up a little and it definitely wonÃ¢â‚¬â„¢t stress you out. Very cute! What a fun family project. Our son got a guinea pig when he turned 5 and she’s been the best pet! Ha! I love the GPTV! Bravo, all! Just great! My kids think the videos are very fun and the guinea pig is so cute. They have their own pigs.